Marion County Fire District 1 offered a compromise to the City of Keizer and Keizer Fire District earlier this week, in hopes of avoiding an election deciding which fire agency will serve the Clear Lake neighborhood. The proposal would essentially reset the status of ambulance service in north Keizer – a move that purportedly sparked KFD’s move to annex homes in that area. Both agencies have admitted to spending nearly $100,000 each on various legal challenges and responses thus far. The MCFD board offered Wednesday to conditionally reinstate an ambulance service agreement that would designate Keizer Fire District as the primary medic responder. The move by MCFD to end that agreement would in theory send an estimated $75,000 per year in ambulance revenue back to Keizer Fire District. The board also said it would drop the lawsuits and state land use actions filed against KFD and the City of Keizer. However, the board signaled it would not go so far as to move its medic out of the Clear Lake station entirely, with a key caveat in the motion that the arrangement not degrade service in the Clear Lake area. Said reinstatement would hinge on both the city and Keizer Fire dropping any annexation attempts. While the city has been named in the legal documents, the Keizer Fire District board has agreed to pay any legal costs incurred by the city due to the annexation. The framework was credited to an editorial by Keizertimes Publisher Lyndon Zaitz. The editorial was mentioned several times during the discussion. MCFD Chief J. Kevin Henson expressed some reservations, saying the move could result in less ambulance protection for the Clear Lake area. He suggested he’d be open to a variety of arrangements, including placing a Keizer Fire ambulance in MCFD’s station at Clear Lake. “I wouldn’t want the residents of Clear Lake to think we backed away from them and reduced the service level,” Franke added. A unique arrangement puts parents almost entirely in charge of the city’s baseball fields, and its sustainability remains an open question. In a city famed for its low taxes, the city of Keizer has largely turned over to volunteers the type of tasks that most everywhere else is at least partially publicly subsidized: Everything from field maintenance to capital projects like new retaining walls, backstops and fences. It’s been that way since the city bought two parcels on Ridge Drive totaling 21.4 acres to create Keizer Little League Park in the 1980s. The city has kicked in time, resources and cash for major projects like permanent restrooms and drainage improvements, but City Manager Chris Eppley said the bargain for taxpayers is unique in the Mid-Valley. The group operating the fields is asking for the city’s financial help for both maintenance and improvement projects. That volunteer group in our community is Keizer Youth Sports Association, which grew out of a split among Keizer Little League parents. 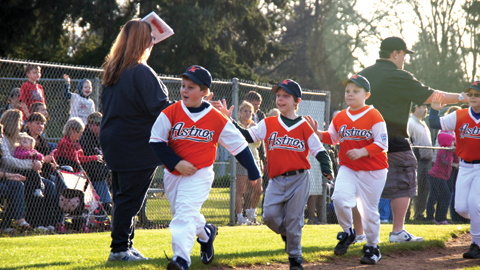 A group called Keizer Little League still exists and plays ball at the park. Both claimed the lineage of the original Keizer Little League group that managed the park for more than 20 years in what was at times quite an acrimonious split. Residual effects are still apparent, as when Keizer Little League president Cari Buchholz tesitfied before the Keizer City Council that her group and KYSA can’t come to an agreement on exchanging volunteer labor for cash credit. KYSA charges all groups, including KLL, who wish to use the fields. Kurt Barker, baseball program director for KYSA, sought and got a $10-per-game field fee increase from the city council to $30 per game. Buchholz disagreed with being charged more for fields she and others in KLL think need improvement. “We want to work with KYSA to keep the fields in good, clean condition for the city of Keizer,” Buchholz said. Barker said the fee increase was needed to essentially help keep the group’s collective heads above water. And he questioned whether all volunteering should be considered for a financial discount, noting KYSA parents also volunteer but don’t pay less in fees because of it. He said the arrangement puts KYSA at such a disadvantage that 2012 could be the group’s last year managing the park if changes – notably more city funding – aren’t made. Viewpoints diverge as to why an all-volunteer arrangement that once appeared to function well is no longer adequate. While city funding and equipment played essential roles in some big projects, Keizer has had perhaps more than its fair share of whom you might call super-volunteers: The kind of people for whom noble efforts like coaching ballteams or manning concession stands is just the beginning, who at times of the year spend more time at the ballpark than at home. Others think it’s more a matter of willpower, of having rules – and enforcing them. When he was a softball parent, he said he spent three days a week mowing the fields himself. Eppley points out the community lost a huge booster and volunteer leader with the retirement and death of Bob Newton, a former mayor who was a Oregon National Guard colonel. He helped bring training exercises to town that literally moved the earth to shape the little league fields, and is responsible for several of the city’s park shelters along with the bleachers at McNary High School’s football stadium. Rob Kissler, the city’s public works director, donated many personal hours when his son was playing baseball – everything from laying pipe to constructing buildings. But he acknowledges volunteering isn’t as simple as it used to be. “Society’s gotten more complicated with rules and regulations,” Kissler said. Eppley said the future likely will require that the city chip in more for capital projects in particular, but Councilor Mark Caillier said last week the money would have to come from somewhere other than the general fund. “If it comes down to police officers or Little League fields, I’m afraid I’m going to be voting for police officers,” Caillier said. The Salem-Keizer School Board voted to repurpose Hazel Green and Rosedale elementary schools because of their declining enrollments and the financial burden the administration has said continuing them as schools would place on the district. The vote to repurpose the two elementary schools (Hazel Green is in the McNary High School attendance area, and Rosedale is in South Salem) came after several members of the audience spoke against discontinuing them as schools. Objections focused on Rosedale, with Hazel Green mentioned briefly by only two speakers, neither of whom was directly associated with Hazel Green. Speakers referred to Rosedale’s accomplishments, and some doubted that repurposing would help the district economically. Superintendent Sandy Husk said that because of the current shortfall of $20 million to $25 million, with more losses expected in the next few years, the district has been forced to make cuts in several areas. She recommended approval. “It is with great sorrow that we are recommending repurposing,” she said. The vote for repurposing was 4-3, with directors Jim Green, Ron Jones and Jeff Faville voting no. Green said keeping the small-school environment was desirable. Jones repeated his objections to closing schools soon after others were recently opened. Faville said closure would add to crowding problems at nearby schools. In other business, a request for the Salem-Keizer School District to help the city of Keizer extend an urban renewal plan for four years was tabled Tuesday night by the School Board to its January meeting. The city and the Keizer Urban Renewal Agency are seeking the extension because a default by one property owner on a local improvement district (LID) plan payment within Keizer Station jeopardizes Keizer, which secured the LID with the full faith and credit of the city. If the plan is extended, the city and other local taxing jurisdictions would continue to forgo a portion of the property taxes calculated on the increase in value within the Keizer North River Road Economic Development Area during the four years. For agreeing to the extension, the city would pay the other taxing districts, over the four years, the amounts they would forgo during the extension. Mike Wolfe, school district chief operating officer, reported that, after meetings between Keizer and district officials, the district staff recommended board approval of the city’s request. Green said that, because funding levels for the district in the next four years were uncertain, he was concerned that the repayments from the city might not be adequate to meet the district’s financial needs. Director Chuck Lee, whose region includes Keizer, asked whether reimbursements could change if district revenues fall. Gahlsdorf said that they could not, but that one possibility was for an agreement that would be tentative in case revenues fall. Lee, who said after the board’s November meeting that the parties should be able to work out a satisfactory deal, said after Tuesday’s meeting that he was increasingly optimistic now that the district staff had studied the proposal. • Rejected a proposal to establish a Montessori school. The district’s Charter Review Committee had recommended a vote against it because of various financial concerns. • Heard Chair Rick Kimball announce the retirement of Debi Garrigues as board secretary effective the end of the year and introduce Kristy Brooks-Lathers as her successor. • Approved personnel actions that included employment of Christina Lilly as a contract full-time counselor at Keizer Elementary School and Michele Condello as a less than half-time teacher at Forest Ridge Elementary School, and retirement of Marie Cramer as an advanced mathematics teacher at McNary. Iris Maestas, 5, and Aimee Nicholson, 2. Christmas in Keizer is more than light displays and parades. It is also breakfast with Santa Claus and celebrating the holiday ala Mexico. The Keizer Fire Hall was a bustling scene on Sunday, Dec. 11, as hundreds of kids and their parents enjoyed the pancakes, ham and eggs, prepared and served by the Keizer Volunteer Firefighters Association. Of course Santa was on hand to hear the desires and good little girls and boys. View our Santa Breakfast photo gallery. McNary’s girls snapped out of a close first half to whip visiting Grant 60-38 Friday. The Portland school started the scoring in the fast-moving game with an outside shot from Savanna Atherton, but Jessica Darras tied the score with a layin. The Lady Celtics had their biggest first-period lead at 10-4 after an outside shot from Baili Keeton, but then the Lady Generals starting adding points, including a trey by Atherton, and at the end of the quarter, McNary led 12-9. The lead went back and forth in the second quarter, in which each team scored 20 points. The shooting of Deven Hunter, who was to lead all scorers with 21 points, led McNary to stay ahead. Grant’s best moment of the period was a three-pointer by Myleah Musgrave. At halftime, the score was 32-29. Although both teams kept moving fast in the second half, the Celtics’ teamwork held the Generals to nine points for the half. McNary had a run of eight points in the third quarter before Grant got on the board with an outside shot from Atherton, its top scorer with 11 points. Grant got off plenty of shots but seldom made a basket. A jump shot by Teresa Peterson gave McNary its first two-digit lead of the game, 42-31, and the period ended with the score 47-34. The fourth quarter went about the same as the third, dominated by the Celtics. Grant kept playing hard but got nowhere. The Celtic JVs won 60-13. Grant – Atherton 11, Scott 9, Musgrave 7, Newsome 5, West 3, Montgomery 2, Woods 1. McNary – Hunter 21, Keeton 9, Darras 8, Titchenal 8, Peterson 6, Wing 6, Strand 2. McNary’s boys focused on the strong start coach Ryan Kirch wanted but ended up losing to Dallas 64-51 Dec. 8 at home. The Celtics led early and were ahead 14-8 late in the first quarter thanks to two three-point shots by Isaiah Montano. Then the visiting 5A Dragons got hot, with Landon Hattan contributing a trey, and at the end of the period they led their 6A hosts 17-16. Dallas’ Brady McKinley, who was to lead all scorers with 20 points, started the second-quarter scoring with a layin. The Celtics’ Dylan McHugh then hit a three-pointer to tie the score at 19-19. Both sides continued to play the fast-break game, with the Dragons slightly ahead most of the way, but Johnathan Doutt, McNary’s leading scorer with 17, followed a trey with an outside shot for a 29-29 score. Grant Bollman of Dallas then stole the ball and sank a free throw, and a moment later teammate Kelton Chapman was successful on two throws from the line. The halftime score was 32-29 in favor of Dallas. The third quarter was close, but the Dragons maintained the lead. A steal by Montano was followed by another three from him, cutting the Dallas lead to 37-36. The Dragons outshot the Celtics for the rest of the third and at the end of the period led 49-40. McNary ran into foul trouble in the fourth quarter, with Dallas making its shots both from the line and from the field. The Celtics were behind by only four points for the period, but they had been outscored in the other quarters and ended up 13 points short. The McNary JVs beat Dallas 48-44. Dallas – McKinley 20, Chapman 13, Hattan 12, Schmidt 10, Locke 6, Bollman 3. McNary – Doutt 17, Montano 10, Burgess 7, Fletchall 7, McHugh 6, McCowan 2, Robinett 2. McNary’s Devin Reynolds received the outstanding wrestler award after placing first in the 138-pound division Monday at the Perry Burleson Tournament. Reynolds has a 9-0 record for the season. Nine Celtics placed as McNary finished sixth overall out of 16 teams at the tournament, held at Cascade High School in Turner. Other Celtics who placed were Mason Ross, second, 220 pounds; Jeremy Lowe, fourth, 145; Mike Mata, fifth, 113; Joel Hunter, fifth, 285; Louis Palos, sixth, 126; Hector Maldonado, sixth, 132; Andy Downer, seventh, 138; and Caleb Connor, eighth, 120. The top eight teams, with their scores were Cascade, 217; Pendleton, 189; Sprague, 175.5; Sweet Home, 165; Lebanon, 119.5; McNary, 108.5; McMinnville, 93; and North Marion, 89. No matter what measurement you use, the Festival of Lights Holiday Parade last Saturday in Keizer was a success. River Road was lined with upwards to 60,000 people from the parade’s start at Lockhaven to its terminus at Appleblossom Drive in south Keizer. The organizers of the parade did not disappoint. There were lighted floats of every size; there were bands and choirs who braved the 35 degree weather. And of course there was Santa Claus, which delighted children of all ages. It takes a Herculean effort to stage a parade of this kind. Parade directors Cheryl and Bob Mitchell, with the help of hundreds of volunteers, put on a parade that would make anyone proud. There were some comments about the short length of the parade, but in cold weather such as on Saturday, that’s not a bad thing. The organizers’ decision to hold the parade in Keizer was validated by the support it received from the city, parade sponsors and parade entrants. After a one year hiatus the parade was held after calling downtown Salem home for 20 years. Keizer should make sure that our city remains the parade’s home for years to come. It was not only Keizer residents who lined the street; spectators from throughout the region came into Keizer. That’s thousands of visitors who came into our city and from our perspective they were made to feel welcome. The closure of River Road was relatively short; the city of Keizer and its police department are to be commended for working well with the parade organizers. There are very few, if any, cities the size of Keizer that are home to two large parades. The potential for Keizer, its residents and its businesses to build on the success of this parade are endless. Like a parade or hate a parade, having the Festival of Lights Holiday Parade in Keizer was a stroke of good fortune for our city. Let’s assure that it stays here. The City of Keizer has a long tradition of being an excellent business partner to all of our taxing district partners (Partners) while successfully maintaining a lean, balanced budget. In addition, the city has used its one Urban Renewal District (District) to create over 1,300 jobs by bringing new businesses to Keizer in the past five years. Think about that, 1,300 new jobs in this economy… that’s a lot of success! These jobs are varied and include entry level retail to skilled trade and construction positions working at a time when many of us, our families and neighbors, remain unemployed. We are very proud of Keizer’s contribution to the economy. Keizer’s Urban Renewal District was used to pay for improvements in qualified areas to promote private business investment, create jobs, and increase the value of the property. This provided jobs and stable revenue for Keizer and our Partners. Keizer’s District has improved the community by removing above ground power lines on River Road, improving building facades and increasing sidewalk safety, all to encourage business expansion to bring new jobs. It has worked well. Our District was also used to construct a new police department with modern equipment to solve modern crimes and to build a community center that keeps local events local and steer additional business to Keizer and local businesses. The actions taken by the Keizer City Council through this District have dramatically increased land values. The Keizer Station area alone generates over $1,000,000 in increased property tax revenues. In 2005, the Keizer City Council voluntarily reduced the District by one-third, thereby increasing annual revenues to our Partners by $940,000. So, here’s the problem: To make the Keizer Station a reality, the City of Keizer sold bonds and then required the Keizer Station property owners to repay Keizer, over time, for those bonds. Most property owners have kept their payments current; one has not, having missed payments totaling $800,000. This leaves Keizer “on the hook” to make the missed payments. The worst-case scenario could require Keizer to default on its bonds. The Keizer City Council knows that it is imperative we take decisive action immediately to secure the city from its potential default. The city council has asked all of our Partners to approve the extension of 31 percent of the District for four more years; 69 percent of the District would end. This will return over $2,600,000 of the District’s income to our Partners beginning next year. When the remaining 31 percent of the District ends, our Partners will benefit with an annual addition of $1,200,000 in revenue. This is an excellent plan, allowing the City to stay current on its bonds. This is not a bail-out of anyone. The city will foreclose on the defaulting property, sell it, and repay our Partners, making them “whole” for their agreement to the extension. Our Urban Renewal District has been highly successful and will continue to be a great success for Keizer and its Partners without any adverse risk to our Partners. Keizer needs its Partners’ support and commitment to make that success happen. Lore Christopher is the mayor of Keizer. Several opinions were expressed in last week’s Keizertimes about the last City Council meeting. As the saying goes, everyone has a right to their opinion. So, in an effort to get back to the facts, I offer the process the Keizer Fire Board of Directors’ went through to bring Clear Lake to the Keizer Fire District. For years the Keizer Fire Board of Directors has been asked why Clear Lake was not a member of the Keizer Fire District. I began hearing about it soon after I was elected to the Board in 2001. In the first part of this year the Board received letters from two Clear Lake Home owners association; Vineyards Phase II and Keizer Prairie. They were asking to be included in the Keizer Fire District. We discussed options, then proceeded to research the issue. After much research and discussion, a decision to find the best lawyer to advise us and make a recommendation concerning the process was instigated. During March and April, representatives of the Keizer Fire Board met with Marion County Fire District to attempt to reach a resolution to the issue. Though stating they were open to discussion the Marion County Fire District proceeded to terminate a 20 year intergovernmental agreement in which we, the Keizer Fire District, provided the ambulance service to Clear Lake. As part of the process recommended by our attorney, the Board voted to ask the City of Keizer to exercise their legal option and request the withdrawal of Clear Lake from MCFD and consent to service of the area by Keizer Fire. After many hours of testimony over several months, the matter passed 6 to 1 by the City Council on the condition that the matter was to be put to a vote by the citizens of Keizer on March 13th, 2012. After the city vote, the Fire District then voted to annex the Clear Lake area by Board Action, pending the peoples vote allowing us to do so. Even after the Council action, Keizer Fire was in contact with Marion County Fire to find a resolution; again they choose to stop discussion. As this letter is being written, we have, once again, started a process to resolve the issue with Marion County Fire District. The proposed withdrawal and annexation, to be voted on Mar. 13th, 2012, will benefit all of Keizer, including Clear Lake, in services and taxes. Marion County Fires total tax rate per thousand is $2.4205 per thousand. Keizer Fires total tax rate is $1.8441 per thousand. Due to an equipment bond passed in Marion County Fire District, the new Clear Lake rate will be $2.0586 per thousand, still a reduction. The benefit to all Keizer residents will be an additional 12 hours of ambulance coverage per day at no additional tax cost. In addition, if you live in Clear Lake your rate will actually go down. Keizer will have two full time ambulances serving Keizer with two paramedics responding to each event. This is the same model used in Salem, though this level of service is not used by Marion County Fire. The Keizer Fire board looks forward to the City Council passing this matter forward to a vote of the people at their meeting on December 19th 2011. In the interim, the Keizer Fire Department will continue to provide the best Ambulance and Fire Service available to all of Keizer. Joe Van Meter is president of the Keizer Fire District Board of Directors.